My new QSL card designed using GlobalQSL, The revolutionary technology of QSL cards exchange software (http://www.globalqsl.com). Thanks to my friend 4X6UU Paul for his big support. 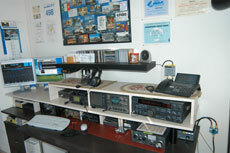 This is the shack I had in Montagnola, with a new Icom IC-7800 for HF Bands and a IC-PW1 Linear Amplifier. The TS-2000 was used as a backup RTX and for VHF/UHF. NCS 3240 Multiswitcher a KAM XL TNC and RigBlaster Plus interface. 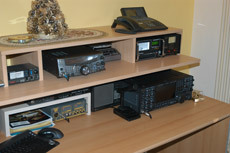 It was a very functional shack, with a new Kenwood TS-950SDX for HF Bands and a TL-922 Linear Amplifier. Servers and PC were connected via a Internal LAN into another room. 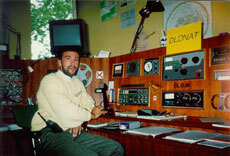 DL0NAT in Kassel during my German studies in 1988. Very good conditions and I met with many ham friends. First experience in a Clubstation. I ws very impressed for the Radios and Antennas. This is my first HamRadio QSL Card. I've got the best QSL service from Ottavio Bevione IK1PML. I live now in Origlio near Lugano (JN46LB). I'm from Melide and I was active also from Montagnola (JN45LX) for about 14 years!